Demonstration at Heathrow is big success! 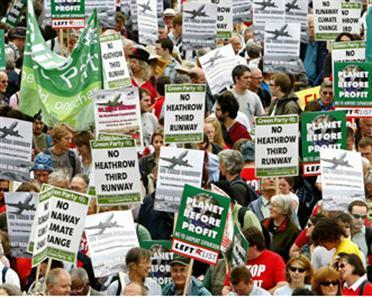 The demonstration at Heathrow was a big success with thousands demanding "No third runway" and "no runway expansion in avaiation" and many calling on the government to "get real on climate change". A colourful procession including local residents, and bus-loads of climate campaigners from as far afield as North Wales and Matlock, left Hatton Cross tube station, and marched around the perimeter of the airport with the 7 foot square CCC 'globe-in-a-greenhouse' on wheels in the thick of the throng, giving a clear climate change message. As the long snake of protestors reached the BAA offices on the Bath Road shouts of "No 3rd Runway" got louder. Soon after that the cavalcade finally thread its way into Sipson village - which will be destroyed if the 3rd runway goes ahead. Here 3,000+ formed a giant 'NO'- an image that was beamed around the media, making the day a huge media success for the campaign. John McDonnell, the local MP, acted as master of ceremonies and George Monbiot spoke to the crowd before everyone retired to enjoy local hostelries and entertainments in the streets of Sipson. 1pm: Carnival moves off. It will process around the airport to Sipson village, a distance of around two and a half miles.